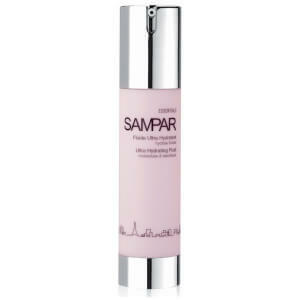 Replenish thirsty skin with SAMPAR's Ultra Hydrating Fluid; an intensely moisturising formula that absorbs quickly to plump, rejuvenate and protect. Infused with a host of beneficial ingredients, including Hyaluronic Acid and White Lupin Extract, the lightweight, anti-ageing fluid works to strengthen and restore vitality, whilst minimising the appearance of fine lines and wrinkles to reveal smoother, more refined skin. 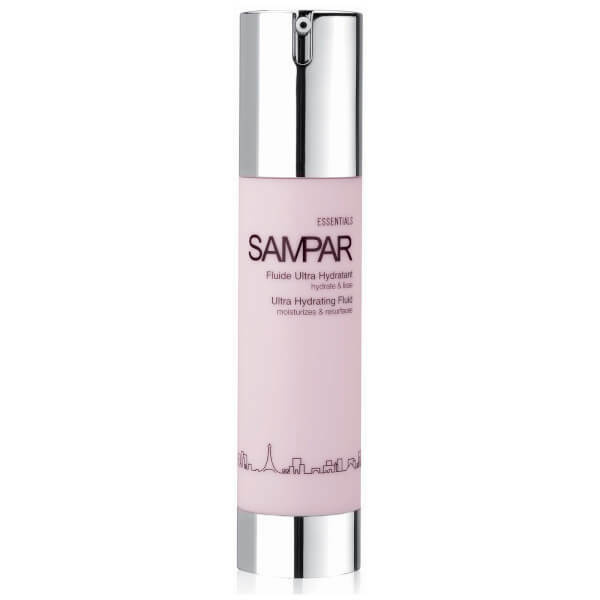 The brand's innovative Urban Advance Complex of Shea Butter Serum, Mint Endorphin and Probiotic Sugar provides superior antioxidant properties to defend against the damaging effects of free radicals and environmental aggressors. Expect a fresh, dewy complexion with renewed radiance. Aqua (Water), Isopropyl Palmitate, Caprylic/Capric Triglyceride, Ceteareth-20, Glyceryl Stearate, Glycerin, Prunus Amygdalus Dulcis (Sweet Almond) Oil, Trilinolein, Cetyl Alcohol, Dimethicone, Butylene Glycol, Dimethiconol, Triolein, Tocopheryl Acetate, Carbomer, Chlorphenesin, Tripalmitin, Trilinolenin, Xanthan Gum, Parfum (Fragrance), Prunus Amygdalus Dulcis (Sweet Almond) Protein, Lactilol, Xylitol, Disodium Edta, Hydrlyzed Lupine Protein, Sodium Hydroxide, Tristearin, Butyrospermum Parki (Shea) Seedcake Extract, Pentylene Glycol, Glyceryl Acrylate/Acrylic Acid Copolymer, Mentha Piperita (Peppermint) Extract, Phenoxyethanol, Triarachidin, Sodium Hyaluronate, Citronellol, Methylisothiazolione, Sodium Benzoate, Geraniol, Propylene Glycol, Butylphenyl Methylpropional, Bht, Ascorbyl Palmitate, Citric Acid.